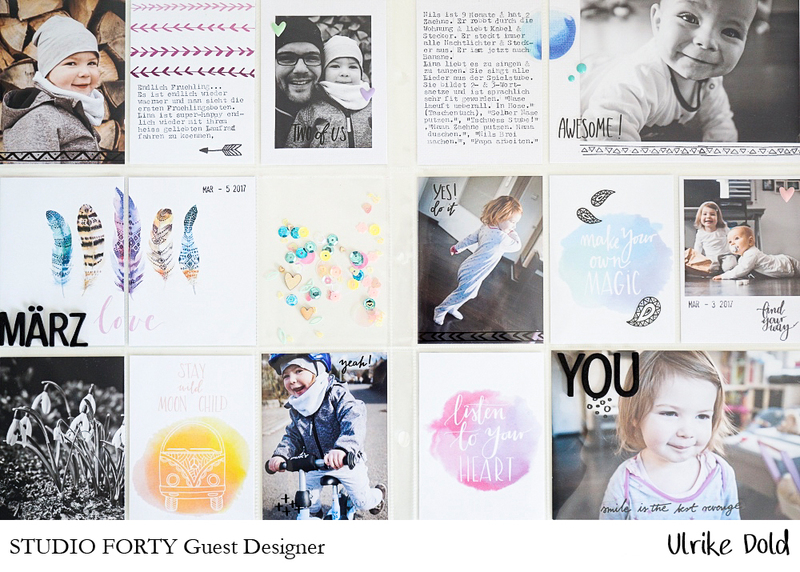 Hello everyone, Ulli here with you today sharing two projects with the amazing new Studio Forty stamps, transparent stickers and project life cards from the „Moon Child“ collection. 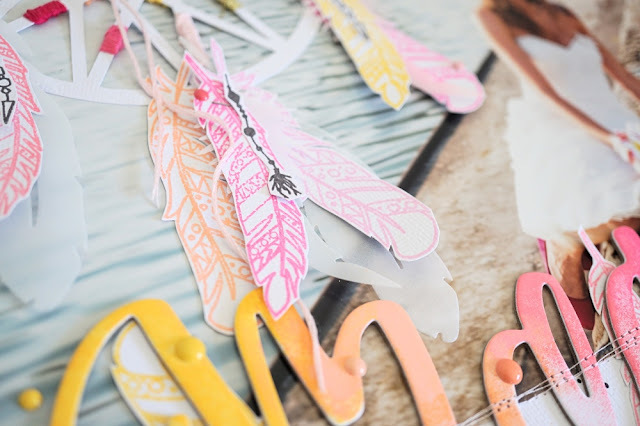 I´m so exciting to be here at the Studio Forty blog! Thank you so much Monika for having me as a guest designer this month! I never have used Studio Forty stamps and scrapbooking supplies before and when I opened my package it was love at first sight. 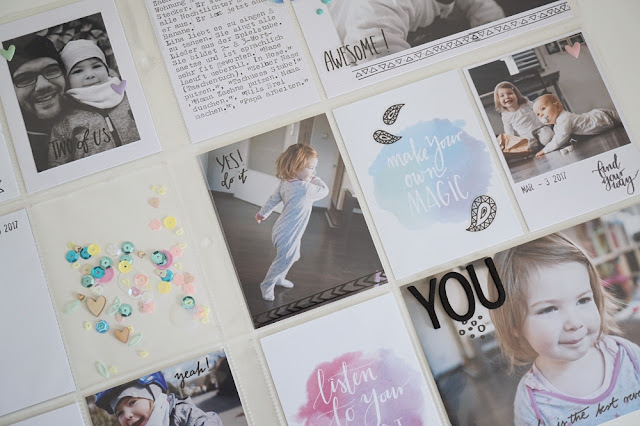 I decided to do first a project life double page with these gorgeous project life cards from the „ Moon Child“ collection. I love the colors and the water color effect of them so much! And I also really love the quotes on them. I am not really actual in my PL and so I did a double page with photos from march 2017. I have used a mix by color photos and some black-and-white photos. 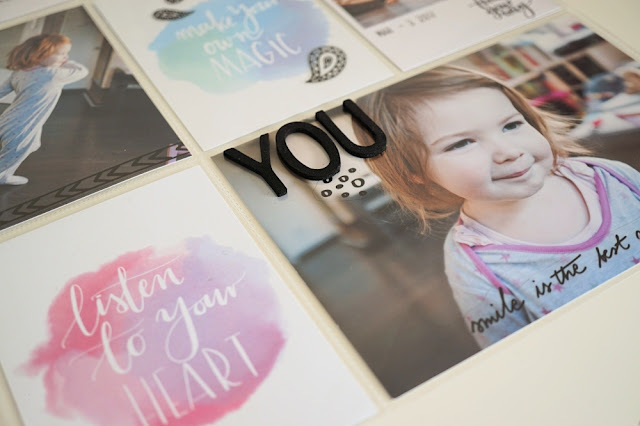 For a bright and light look I used only the amazing „Moon Child“ project life cards with the water color look and some white PL cards as a background for some photos and my journaling. I typed my journaling down with my typewriter on two of the 3x4 cards. As an eye catcher I filled a pocket with sequins in different colors and some wooden hearts and closed it with the fuse tool. 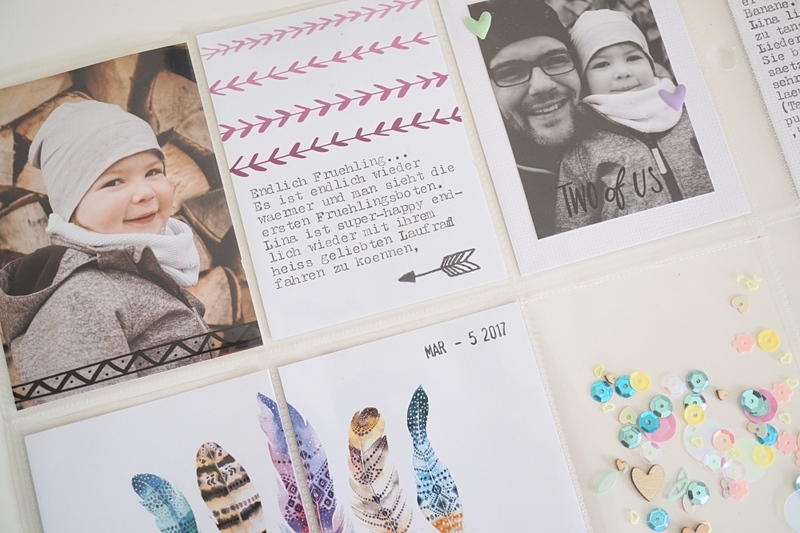 I glued the month „März“ (March) and the word „ You" with black foam alphas directly on my page protectors. 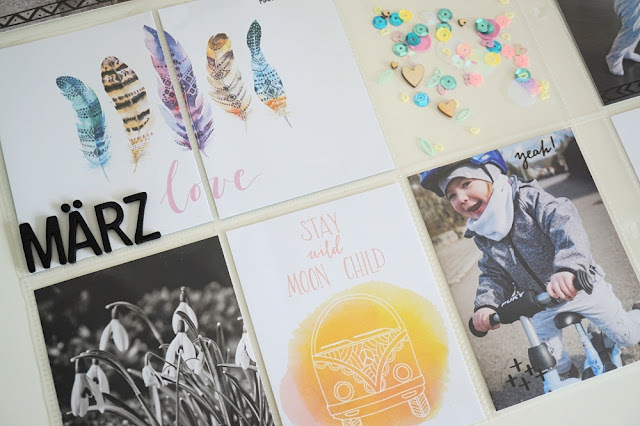 Some of the photos I decorated with the transparent sticker boarders and I also stamped a boarder with the „Moon Child“ stamp set under the big photo at the right side above. The transparent stickers are truly perfect for doing project life. 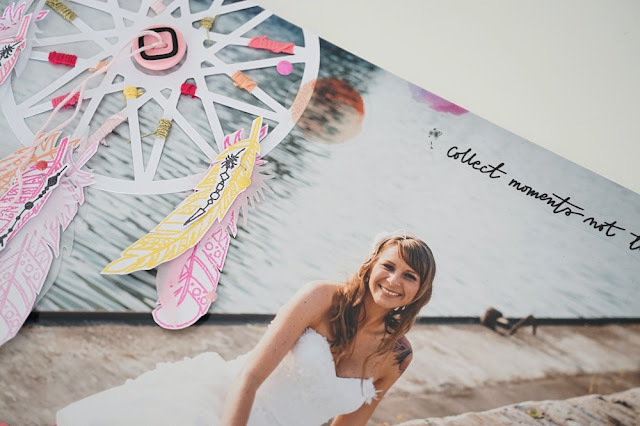 It is such an easy way to decorate your photos. 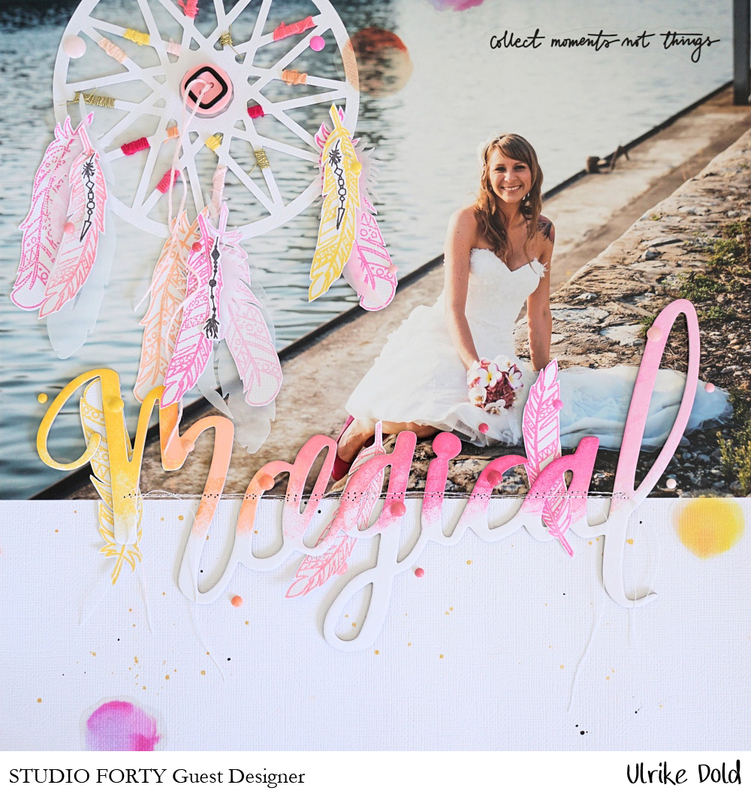 I also decorated two photos with some of the amazing Studio Forty enamel dots and shapes. They are too cute and I love the colors! My second project is a big picture layout in the format 12x12 with a dream catcher. 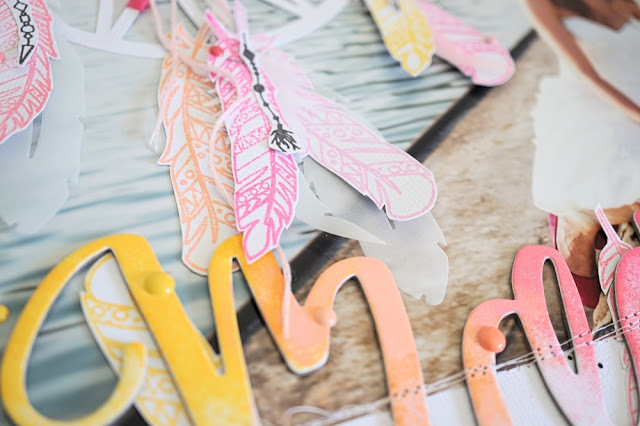 When I saw the „Moon Child“ stamp set with the feathers I knew directly I would do a layout with a dream catcher and so I stamped the feathers in different colors from pink, peach, orange and yellow and did some fussy cutting. I also used a little bit vellum in baby pink and white and punched out some feathers with my Big Shot. 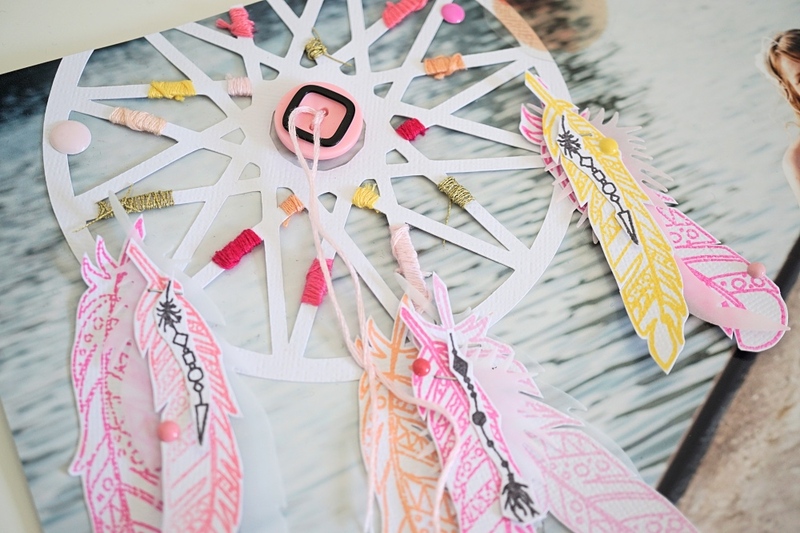 Then I cut out the circle from a dream catcher with my Silhouette Portrait and decorated it with yarn in gold and in the other colors of my color scheme. 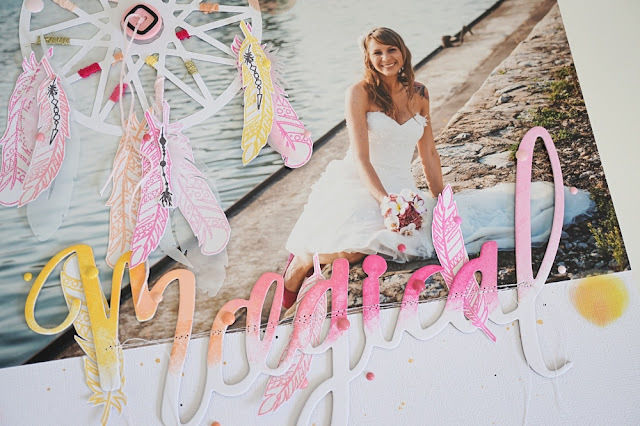 I arranged my photo at the top of my 12x12 cardstock and glued the dream catcher on the left side above. I glued the stamped and punched feathers on the dream catcher and used glue dots to give some of them more dimension. As the title I used the chipboard word „Magic“. I inked the top of the word with some ink pads and made an color transition from yellow to pink. I glued it on the layout and stitched over it with my sewing machine for several times. I decorated the layout with the „Collect moments not things“ transparent sticker from the „ love This Life“ Sticker sheet and the water color circles from the „Colors Of Memories“ transparent stickers. Finally I glued a lot of enamel dots here and there and a button in the middle of the dreamer catcher. I hope you like my projects with the „Moon Child“ collection and I could inspire you in one way or another. Thanks so much for joining me here today! Wesoła gąska | Magda G.
Jesienne życzenia | Magda G.